It’s not hard to remember PROM’s name, which is convenient, because you’re not going to want to forget about this dreamwave duo when they blow up in the very, very near future. A collaborative project between Ella Zoller, Gabriel Stanley and producer Dave Weingarten, PROM is making some of the dreamiest music out there. Today, they release their Holding Pattern LP, a project years in the making, which you can stream below. We also had a chance to speak to Ella and Gabe, whose natural bond is apparent even in an over-the-phone interview. The two finished each other’s sentences and talked about the music they make together in a way that exuded a true creative partnership. Read our Q+A under the album stream. Ella: So my parents have a lot of touring bands through their house. They live in Utah now, but they used to live in Massachusetts, and I had a band called Miniature Tigers come through to stay with me. They invited me to a show, which Gabe was also invited to, at Irving Plaza and we met after the show. Miniature Tigers was my favorite band growing up. Ella: They’re amazing! They’re really nice people. Gabe: It was their first tour with fun. and we all met up at a bar later. That’s how we also met our third member, Dave Weingarten, our producer. We all met and hung out on the same night. Ella: It sparked the whole origin of the project. Where did the name PROM come from? Gabe: I thought it was a great name for a band. I’m very minimalistic as far as band names go. I like short stuff. It’s a word you don’t have to explain to people. It’s very important. So you guys self-describe as making dreamwave music. What do you think the key sounds in dreamwave are? Gabe: Roland synths from the 80s. A warbly, spacious, really open sound. Lots of open, shifting chords. Gabe: Heavy backbeat. It’s a good, slow, satisfying headbang. Ella: I think of it more as a feeling of the dreamy quality of electronic music that allows you to close your eyes and breathe in. A sonic landscape. Gabe: We try to use as many pop elements as possible. Ella: That goes into the whole synth-pop, dream-pop realm. But I think dreamwave is more about that expansive, sound landscape quality. A couple of years ago you released the Keeping Company EP. Has your sound changed or just progressed? Ella: This is our first full-length, so it’s ten songs. Coming up with material for ten songs means we have to draw inspiration from all sorts of different places. Gabe: Each of these songs is it’s own little wormhole. They definitely each embody a specific feeling and story. We didn’t really do that with the first EP. The first EP was more exploratory, this one is more focused effort at writing an album and writing individual songs that stand alone. Wow, you actually just answered my next question, which was “tell me more about this LP.” How did these songs make it on to this album? Were you writing to make an LP or did you just keep writing songs until you ended up with enough for an LP? Gabe: I think we ended up with enough. We hit a point where we had been writing really heavily, and we had impressions of these individual songs and we thought “oh man, these fit together.” And the time was right to make a cohesive album. Ella: We set out to write an LP with our producer. It kind of came in two waves. I noticed, looking back on it, that we had five songs first that we put together thinking they could make for an interesting EP, but wanted to keep going. So we kept going, and that’s where a lot of the weirder songs came from. Really digging deep into that well of inspiration. Then we actually have two songs that were supposed to be on the first EP, one of them needed a little more time to marinate, so we revamped it and now it’s one of our favorite songs. It’s called “I Know How It Is.” That one we wrote in 2013. “Darlin” was one of the first songs we wrote together as well. It’s been on our Soundcloud for a while. We redid some vocals and put some more sparkles in there, and we’re releasing that one on this album, too. We’ve been playing it live for years. So you mentioned this “well of inspiration.” Is there any direct influence that you can name? Gabe: I definitely troll Youtube and Soundcloud for random stuff all the time. That’s where I derive most of my inspiration from. Digging into interesting little weird internet projects. And then also, New York, our scene, our house, our friends. We have had some amazing neighbors that are making music that I happen to be very into. Jeremy from Chrome Sparks used to live next door. Gabe: I used to live with X Ambassadors. So I have all of these friends who are making stuff on a different side of the spectrum from us. There’s something about living in this neighborhood, living in Williamsburg/Bushwick. So I don’t actually have to look too far to derive inspiration. In college I felt like I really had to search out for inspiration, but living here I feel like I don’t have to look as hard. Ella: I kind of have a different experience. I studied theatre in college and a lot in high school. For eight years, I kept a really extensive journal where I’d write a lot of poetry. I’d write a lot of ideas from classes and things like that. For this album, a lot of the poetry in there comes from me looking back through my old journals and finding little nuggets of words that I liked and stringing them together and create songs out of them. Most of the lyrics that I’ve written have been from past poetry that I look back on, remembering feelings and writing about them. Gabe: Whatever they were looking for. It’s so open. We take a lot of care to sonically inject the feeling that we want into the listener. But in a lot of ways, the songs are wide open for a reason. I like the way that when you’re watching television your brain has to fill in a small percentage of the information. I feel like our music has that effect. We leave a lot of things open intentionally so that there’s a lot of room for interpretation and feeling on the end of the user, the listener. Ella: Oftentimes I’ll hear what people think songs mean and I’m like “oh wow! Great! That’s exactly what that means.” It just means whatever it means to you and that’s the most valuable thing. Take whatever you want from it. Gabe: We’ll get you 80% of the way there. Who do you think is making the best music out there right now, in your opinion? 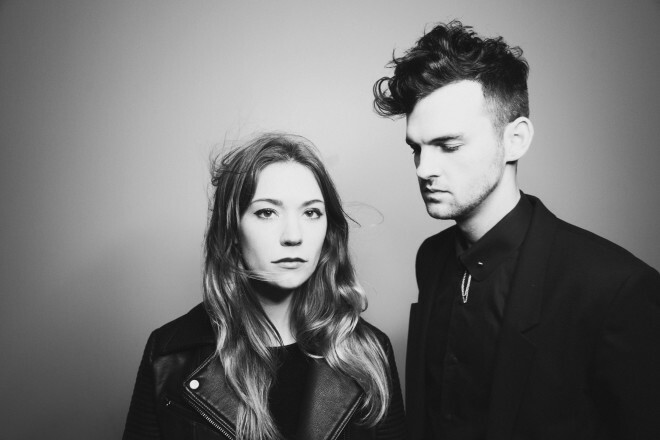 Ella: We both really like Tourist’s album that came out in May. Just really solid electronic music. Since we’ve been writing an electronic album, I’ve started looking back into things like Smith Westerns and Crocodiles. Someone I love who’s been making great indie rock is Oberhofer. I love Brad’s album Chronovision that came out in 2015. Just a brilliant songwriter. Really good stuff, really accessible. We listen to a lot of different music. I know Gabe also really likes Rihanna’s Anti. Gabe: I’m gonna give the generic answers. Tame Impala. Rihanna. And San Holo. Oh man, San Holo is one of the best producers out there right now. Ella: That’s what we’re saaaayin’! Gabe: Between those three genres, we’ve got it covered. That’s where I’m coming from, as far as melody goes. I’m a big a Jimmy Eat World fan and all of that super indie pop stuff from when I was a teenager, that stuff is always in there through minor seventh harmonies or whatever. But people don’t want to hear about that [laughs].